A day after the French leader had put on a show of warmth and brotherly affection for Trump at the White House, his blunt speech prizing engagement over isolationism reinforced the French leader’s emerging role as a top defender of the liberal world order. It was a marked shift from the simpatico Macron of only a day earlier during his state visit at the White House. In his first year as France’s president, Macron has carefully cultivated as close a relationship to Trump as any world leader can boast. But addressing a joint meeting of Congress — an honor granted only occasionally to leaders of close U.S. allies — Macron confronted his differences with Trump head-on. It was an allusion not to an impending Trump about-face, but to the prospect of America choosing a different path under a successor, whoever that may prove to be. Asked by French reporters about his comments later during a visit to the Martin Luther King Jr. Memorial, Macron said with a smile that he doesn’t expect Trump to rejoin the Paris accord but does expect that America will. 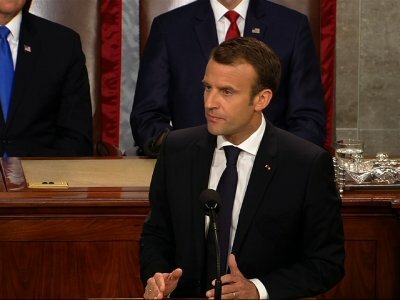 Macron’s hourlong speech to Congress, delivered in English, provoked obvious delight from congressional Democrats, who erupted repeatedly in cheers and standing ovations for the visiting Frenchman — a contrast to the mostly silent reaction from Republicans in the House chamber. To some, it was an ironic reminder that more than a year after being walloped by Trump in the election, Democrats have yet to coalesce behind either a cohesive message or a messenger, still plaintively searching for the kind of energetic, fresh-faced leader that Macron represents. For Macron, the exuberant reception may have been equally ironic. At home, Macron does not enjoy the same level of applause or enthusiasm. A centrist in France, he’s currently criticized more from the left than the right, notably for ending France’s famed worker protection, and he’s often derided as the president of the rich. Trump’s positions on trade and overseas obligations have chipped away at America’s position as the spokesman for that movement. And German Chancellor Angela Merkel, seen in recent years as the inheritor of that role, has faded somewhat amid domestic political challenges in her country. That France sees itself as uniquely equipped to help fill that void seemed evident as Macron called for communal action to address “urgent” threats to what he called fundamental values. “Today, the international community needs to step up our game and build the 21st century world order,” he said. It wasn’t all criticism from Macron. He sought to showcase the historic bond between the U.S. and France, touting the two allies’ “constant attachment to freedom and democracy.” Yet he also mentioned “fake news,” a point of contention between Trump and others, and warned that lies disseminated online are threatening freedoms worldwide. Associated Press reporters Alan Fram and Laurie Kellman in Washington and Angela Charlton and Sylvie Corbet in Paris contributed to this report.